A grocery shop has been fined after an employee's fingers were mutilated when his hand got stuck in a meat mincer. His hand could not be freed at the scene in MAS Bazaar Birmingham Ltd's shop and was removed from the mincer at hospital on 12 April 2017. The store, in Lozells Road, admitted failing to ensure "as far is practicable" the health, safety and welfare of its employees. 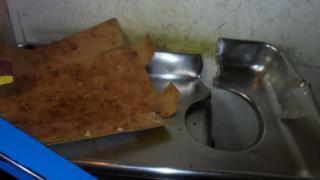 It was fined £36,000 by Birmingham Magistrates' Court. The mincer should have been fitted with a metal guard. Birmingham City Council, which brought the charges against the business, said: "As he fed meat in to the machine with his left hand, it came into contact with the mincer's screw feed mechanism. "His hand was so seriously injured that four of his fingers were mutilated." As well as the £36,000 fine, MAS Bazaar Birmingham Ltd was also ordered to pay £3,268 in court costs and a £120 victim surcharge. The BBC has approached MAS Bazaar Birmingham Ltd for comment.